The Waimea High School JLAB Leadership Team advanced to Level II out of 1371 teams worldwide and advanced to the Level III championship round out of 597 semi finalists. 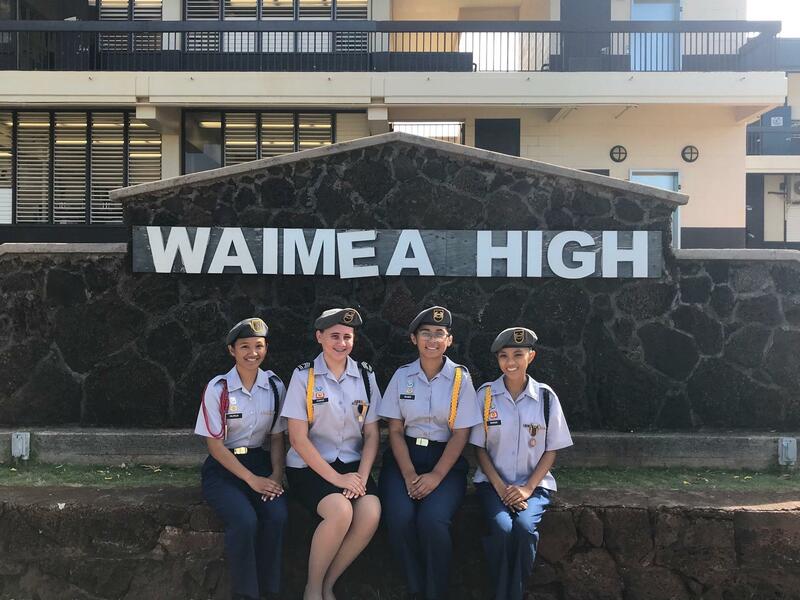 Waimea HS Leadership Team was the only Hawaii based team out of 4 programs from the 8th ROTC Brigade which oversees the western region of the United States, American Samoa and Asia. Each high school enters a team in both the academic (general subjects) and leadership (JROTC specific) division. The team consists of 6 student cadets ranging from 9th grade to 11th grade but only 4 are selected to compete at the national level. The Waimea team is coached by Major Victor Aguilar, US Army Retired and assisted by Sergeant Major Keith Castaneda, US Army Retired. The 4 man team and Major Aguilar will be travelling to Washington, DC in June to compete against the top 40 teams worldwide. This will be the 5th time Waimea High School JROTC has made it to this level. The team members are: Julie Jane Remigio (10th grade), Ariell Siliado, (10th grade), Zsa Zsa DuBose (10th grade), Amber Drake (10th grade), Glydelle Valmoja (9th grade), Michael Thompson (9th grade). Amber and Michael are not shown and will not be travelling to the championship, they did contribute to the success of the team in earlier competitions. The contest is sponsored by the College Options Foundation Ref: cofcontests.com. Fee Collection for School Year 2019-2020 will be Monday, July 15, 2019 to Tuesday, July 16, 2019 from 8:00AM to 12:00PM in the Bandroom. Parents and Guardians..... next Tuesday, March 12th, will be a very busy day for all students. It is our annual ACT and PreACT testing for grades 9, 10 and 11. It is also our Senior Picnic day up at Kokee. If your student is testing please send them to school with a snack and a bottle of water or juice. Testing will begin promptly at the start of school. Students will be required to put away all cell phones for the entire test and they will not be allowed to wear any smart watch or device during testing. 9th and 10th will be released at the end of lunch period, 12:30 pm. Junior testing will continue after lunch and concludes at 1:30 pm. Please encourage your child to do his or her very best on these tests as they are used for college entrance and scholarship applications. If your student is a senior, please send them to school on Tuesday with a home lunch. Their bus will leave promptly at the start of school and will return by 12:30 pm. If you have any questions, please call the school. Thank you very much! Please come and join us at our next school community council meeting on March 13, 2019 at 6:30 pm in our LRC. Here is the parent letter template for the "Momo Challenge" situation. Parent and guardians.... I'm asking for your help. We are struggling with students vaping at school. The mods are small, easy to conceal, and look like flash drives... making it easy to conceal and difficult for us to catch. Also vaping doesn't have a distinctive odor like regular cigarettes. Please spend some time reading the attached slides and watching the short video that's embedded within and then have a conversation with your son or daughter. If you have any questions or concerns, please call me at school, 338-6800. Thank you.... Mahina Anguay, WHS principal. Please support the WAFF pancake breakfast fundraiser on February 9th! WAFF provides over $10,000 in annual scholarships to Waimea HS graduates as well as purchasing supplies and equipment for the school and teachers. Thank you! Seniors who live in Kekaha.... are you planning to attend college next year? Here's a scholarship just for you and you don't have to be an honor student to apply! The Kekaha College Financial Assistance Program will award Kekaha residents attending a public college or university $1,750 in Fall 2019 and up to $1,750 in Spring 2020. If you are interested, contact Mr. Dan Abadilla (father of two WHS alumni), at 808-346-1830 or through email at abadilla@alum.bu.edu. The application deadline is December 31, 2018. Again, you don't have to be an honor student to receive financial assistance but you must apply to qualify. Thank you! Up to $1,750 for Spring 2020.